Now is the planting season. As the Moroccan people do the best they can to plant trees and herbs that will enhance their future and bring food security, it is also worth asking a question. How can farming families plant, adding value to their product according to their potential, thus overcoming subsistence practices that trap them in poverty? The good news is that the practical elements of a solution exist. Now it is a matter of bringing pilot projects to scale for the nation, as enormous as the challenges are to planting on this magnitude, with their implications for water management and the absorption by markets of far greater quantities of product. Firstly – and thankfully – in the very areas where poverty is most concentrated there also exists a wide range of indigenous tree and plant varieties that flourish without the application of pesticides and other chemicals. The list includes fruit trees such as walnut, pomegranate, olive, lemon, fig, carob, date and almond as well as medicinal and aromatic plants such as capers, lavender, mint, oregano, rosemary, sage and thyme. Securing the organic certification of these and other species greatly enhances product value. Moreover, with this wide range of product (and potential for added processing, such as drying or oil extraction) market saturation can be avoided and each region afforded the opportunity develop agriculturally according to their specialized organic pathway. 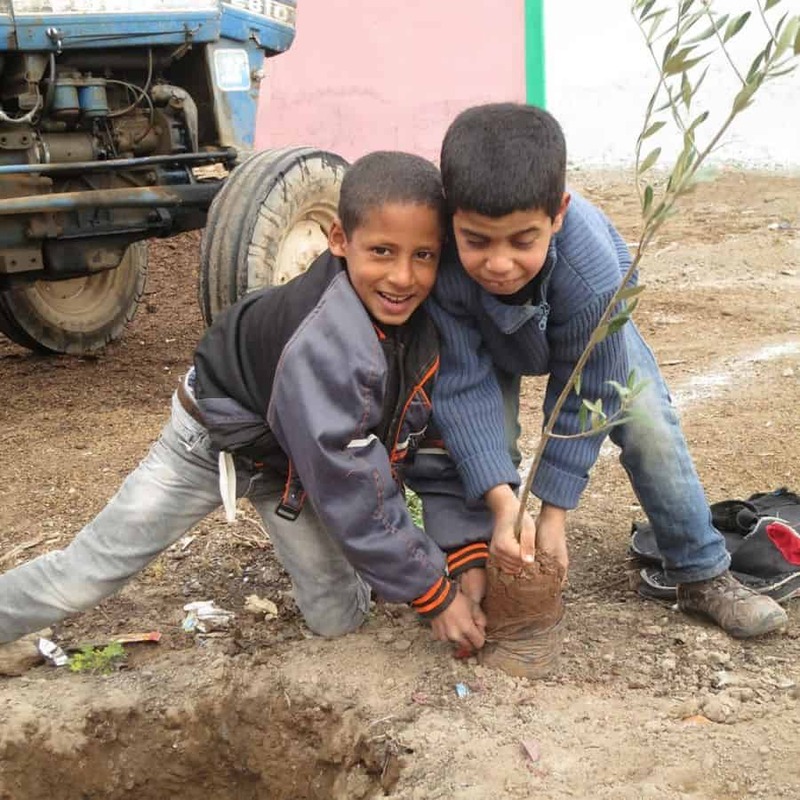 Secondly, a Moroccan government agency – the High Commission for Waters, Forests and Combating Desertification (popularly known as ‘Waters and Forests’) – has been notable in its support of pilot projects by lending land on which community tree nurseries have been established. A great number of these nurseries must be created for the Kingdom to generate the billion plants estimated to be required to lift its inhabitants out of the cycle of poverty. In addition nurseries should be decentralized in organizational terms; they should specialize in plant varieties native to their particular region and finally they should facilitate the training of local community members in the complete process of establishing and running further tree nurseries. However, farming families have understandable concerns about risk as they make the transition from the historical barley and corn cycle – even as it keeps them in poverty – to more lucrative cash crops. The loan of land by Waters and Forests enables farmers to overcome these concerns since, from their perspective, they will not lose the use of their arable land for the two-year period necessary for trees and plants to mature from seeds. From the project-level perspective, the contribution of Waters and Forests is not only highly commendable but actually essential in the bid to overcome rural poverty. Moreover, it represents a flexibility on the part of the agency in adapting to include not only regular forestry trees but also, potentially, indigenous, organic fruit tree and aromatic plant varieties. The successful pilots can now be expanded to between 500 and 600 possible sites throughout the Kingdom, this initiative ideally taking place within the framework of a clear national development strategy. The actions of Waters and Forests not only exemplify the vision needed to address fundamental barriers to sustainable growth but also make the agency the leader in terms of contributing land for this purpose in Morocco (the pilot site being a walnut nursery in the Asni municipality in the Marrakesh region that today boasts nearly 250,000 walnut trees). Where Waters and Forests have led, others are beginning to follow. The Jewish community of Morocco, with approximately the same number of potential sites, could become another vital large-scale contributor of land for community nurseries throughout the Kingdom. The cultural background to this is fascinating in itself – and practically unique to Morocco. The custom of saint veneration entered Moroccan Muslim and Jewish life several centuries ago. As a result (and in addition to their Muslim equivalents) there are hundreds of Jewish personalities, male and female, buried in isolation as well as in established cemeteries, typically in rural locations. Following the diminution of the Jewish population in Morocco during the last century, the tradition has been upheld by the community that remains as well as by a lively diaspora and with the practical and moral support of the Moroccan government and people. Aside from the maintenance necessary for these sacred sites, there is potential in the arable land that often lies beside them unused. The pilot site for what is essentially an intercultural initiative, bringing new hope to local Muslim farming communities from Jewish-maintained land, is at Akrich in the Tamsloht municipality, again not far from Marrakesh. Thirty-thousand trees have already been raised and distributed in kind from the nursery, which was recently visited by the Governor of El Haouz province, Mr. Younes El Bathaoui. A total of seven such parcels of terrain have now been made available for loan and the initiative is poised to be launched across the Kingdom. All of this exemplifies the model, both progressive and practical, that has been adopted in Morocco. In a developing nation where cultural preservation as an end itself may be viewed as a luxury, it has been decided instead to create a framework to celebrate the Kingdom’s mosaic of cultures while simultaneously advancing human development goals. Moreover, Morocco may be the only place in Africa and the Middle East where local Muslim and Jewish collaboration through this creative use of cultural resources is promoted and is taking place. It is only right to encourage other contributors to follow suit by lending land for the establishment of community-managed fruit tree and medicinal plant nurseries. For example, the Ministry of Agriculture has hundreds of agricultural extension centers across Morocco, each potentially a location for a community nursery. It remains the case that combining all the parcels of terrain available to Water and Forests, the Jewish community of Morocco, and the Ministry of Agriculture and dedicating them to this use would generate between 80 and 100 million plants each year. With these three contributions alone, Morocco would be well on its to achieving the billion necessary to end the scourge of seemingly relentless rural poverty. What is more, successful fruit and green growth initiatives can provide the financial basis for investment in a whole host of projects – education, health, women and youth empowerment – where the potential is great and the need for justice urgent. Now is the planting season – if we are successful in this, opportunities to plant further hope will be boundless.